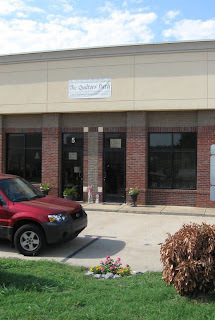 A lovely new quilt shop that has been open for just about a year is The Quilters Path, located in Mt. Juliet (east of Nashville), Tennessee. 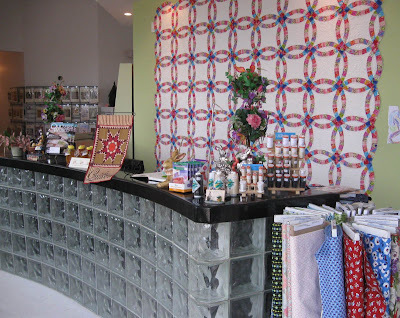 The building's "Plain Jane" facade is quiet and unassuming, but once inside the front door, a magical world of fabric inspiration and childlike playfulness opens up to you like a trip down Alice's rabbit hole. 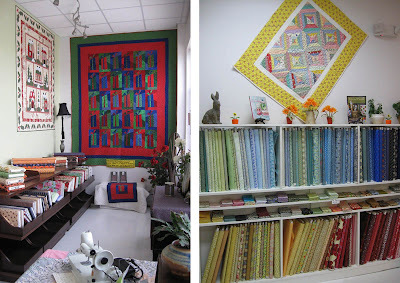 Marita, the shop's owner, has transformed what used to be a hair salon, into a fabulous quilt shop with a mix of contemporary fabrics, reproductions, 20s and 30s prints, and quilting projects with a focus on appliqué, hand stitchery and embroidery. Fabrics, patterns, threads, quilts and notions mingle with pieces of pottery, potted plants, vintage prints, boxes and other collectibles. 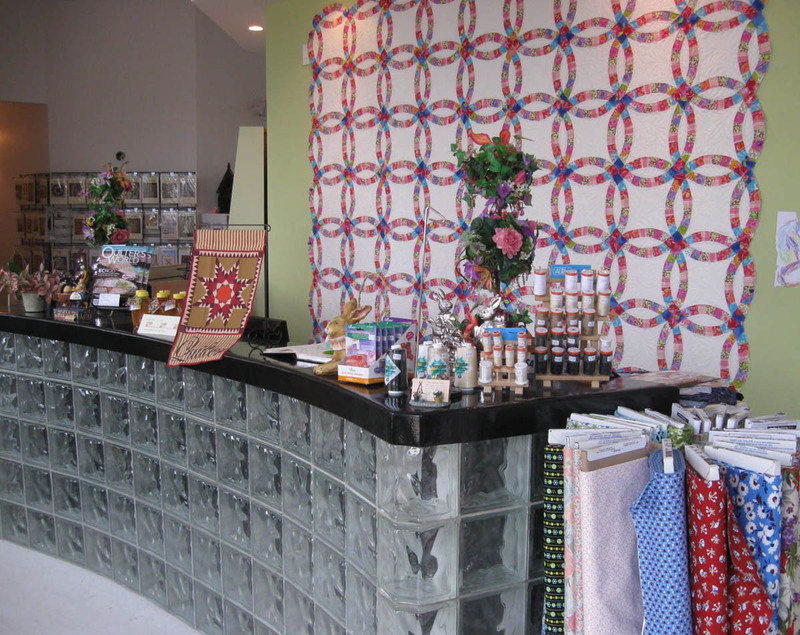 A double wedding ring quilt—a traditional classic pattern—hangs behind the glass counter at the entrance. The color scheme and the fabrics, however, give it a fresh, modern feel. 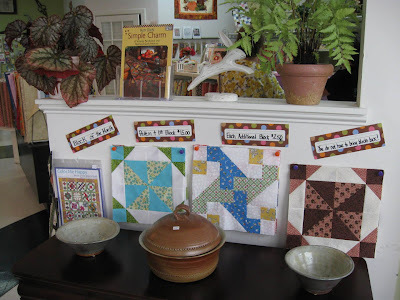 The front counter in the entrance of The Quilters Path. A selection of reproduction fabrics, shirtings and traditional prints are near the front of the store. To the right of the front counter are sample blocks for the current Block of the Month (BOM) program. Block of the Month sampler blocks. Then you walk into the main area and move among more rows of fabrics. The high ceilings and recessed lighting provide an openness to the space while two chandeliers add a touch of easy elegance. 20s, 30s and other sweet and whimsical fabrics. 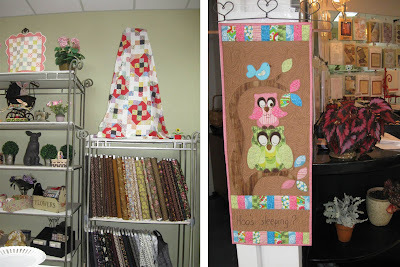 A bolt graphic pieced quilt hangs beside a holiday appliqué quilt (left). 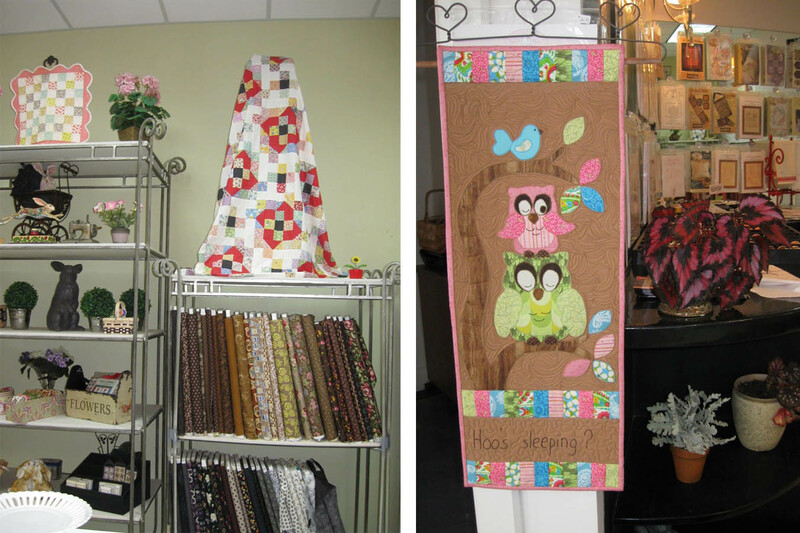 A scrappy string quilt, hanging caddywhompus (right), adds to the shop's charm. Directly behind the front counter is the classroom area where two women were working on projects during my visit. Marita offers the space for sit-and-sew sessions. Candice and Shirley introduced themselves and invited me to sit down with them while Marita tended to business. I felt very welcome. 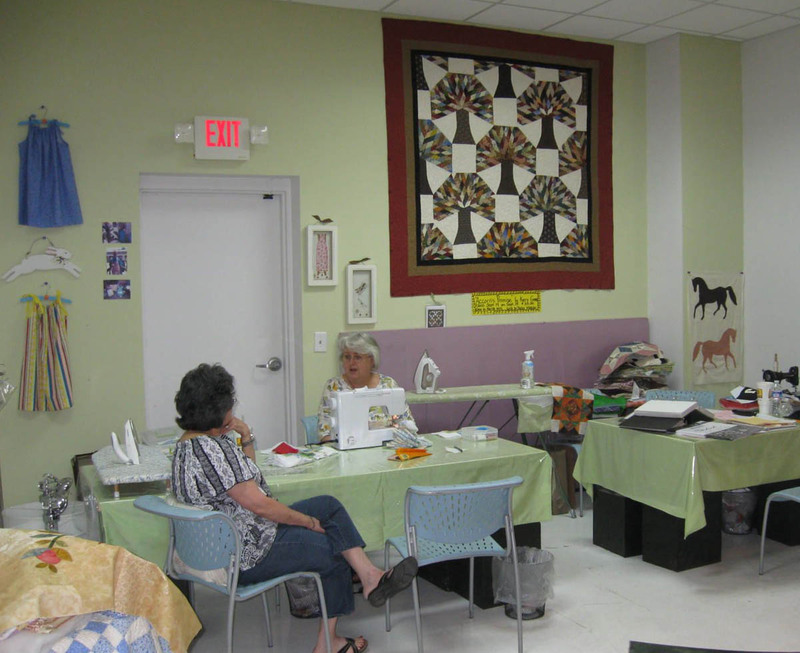 The classroom space is available for sit and sew sessions. 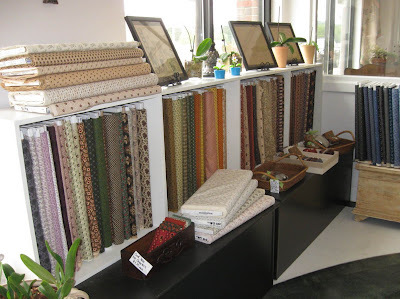 Marita often helps her customers choose just the right fabrics for their projects. 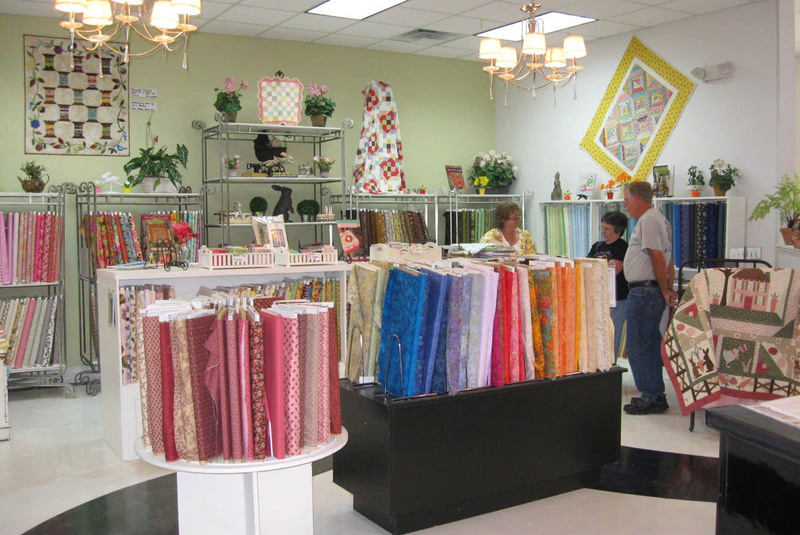 The ladies at the sit-and-sew were extremely complimentary of Marita's eye for color and pattern as well as her exemplary customer service. Marita spends time with customers to answer their questions. 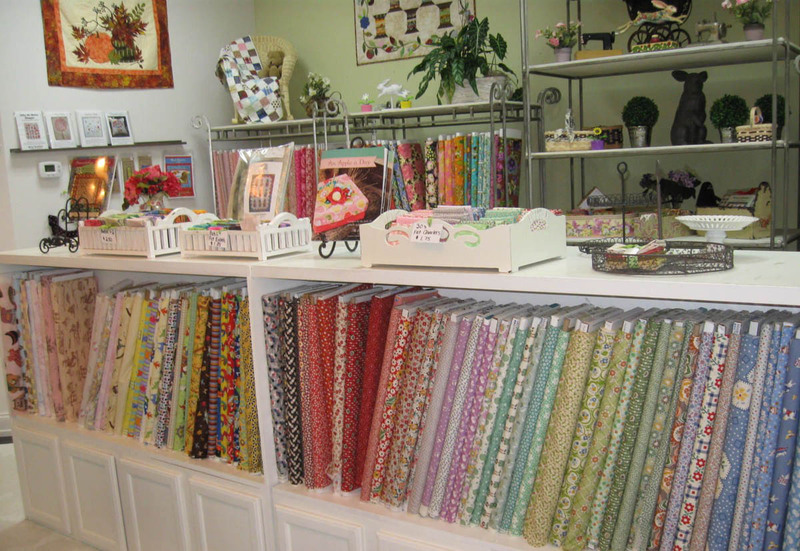 The Quilters Path offers supplies and patterns for hand stitchery. 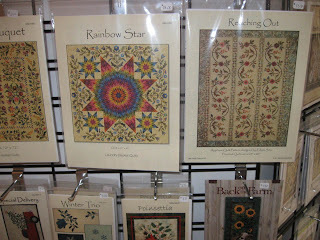 The quilt blocks in the beautiful quilt pictured below has hand embroidered flower baskets. The workmanship is exquisite! 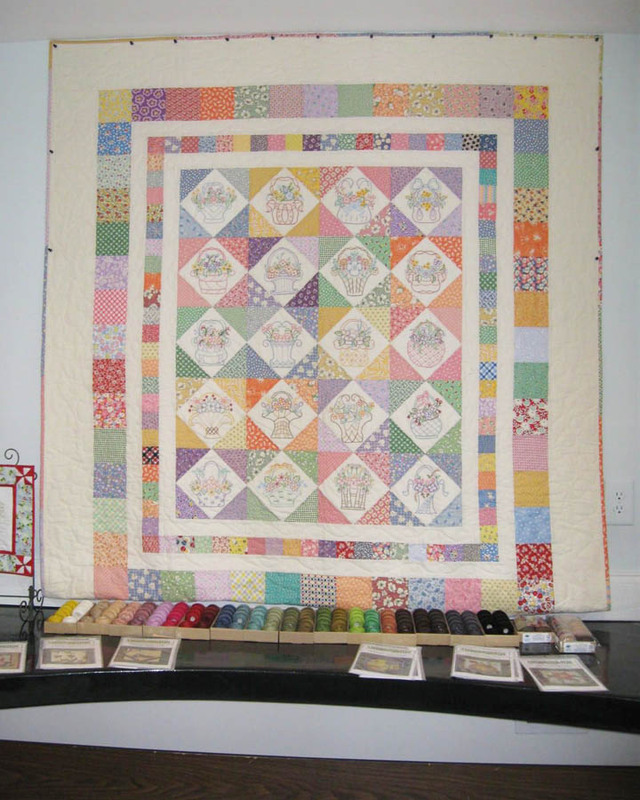 Beneath this embroidered quilt is a selection of embroidery threads in a full color gamut. The Quilters Path also has a nice selection of hand embroidery kits and hand stitching patterns in addition to quilt patterns. 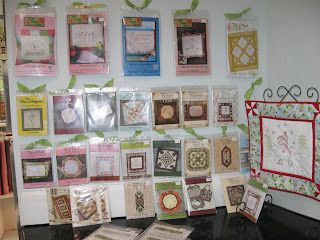 Patterns and kits for hand stitchery projects. 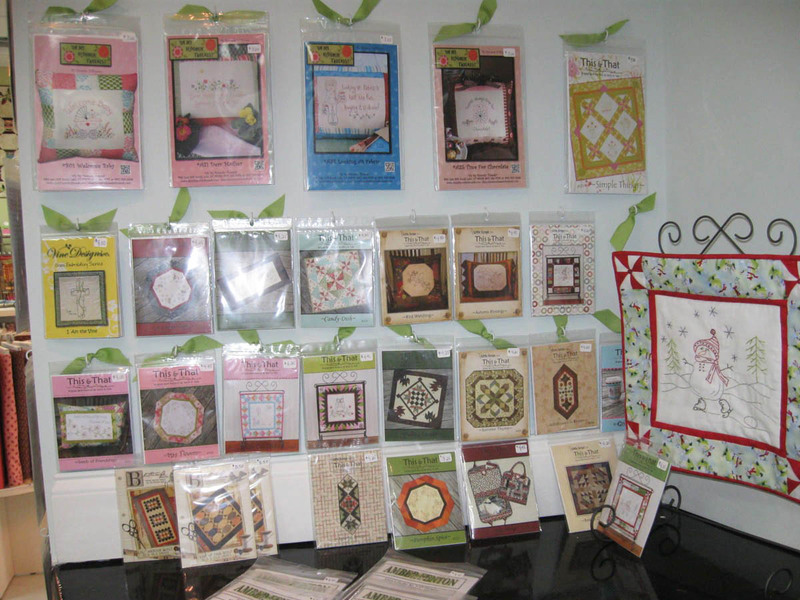 Another specialty of this shop is appliqué. This wall hanging is in the classroom area. The machine quilting on this piece was gorgeous. 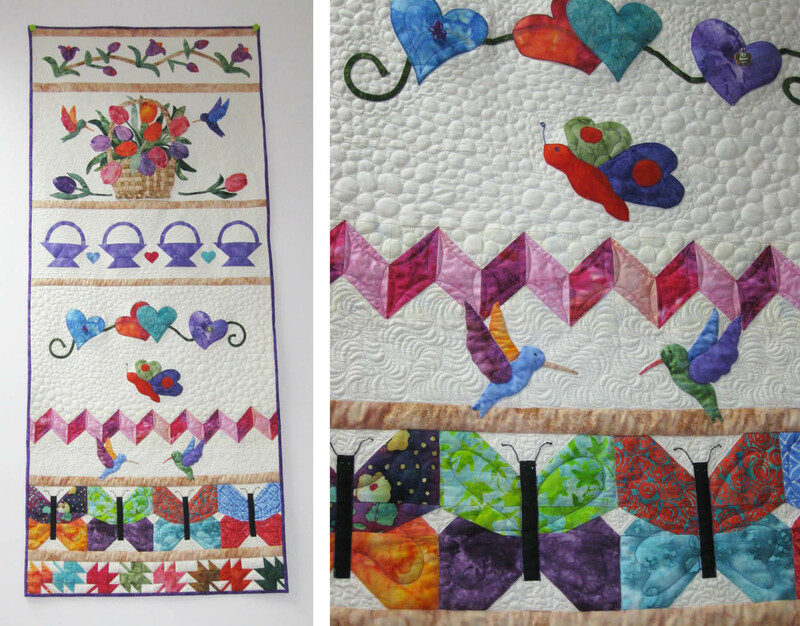 Pieced and appliquéd wall hanging and detail of the quilting. 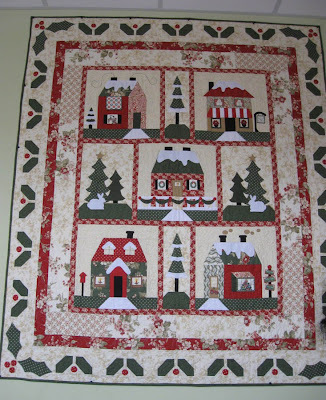 Notice all the details in the blocks and the border of this appliquéd quilt! This appliqué quilt had a winter theme. Pieced and appliqué quilts, large and small. 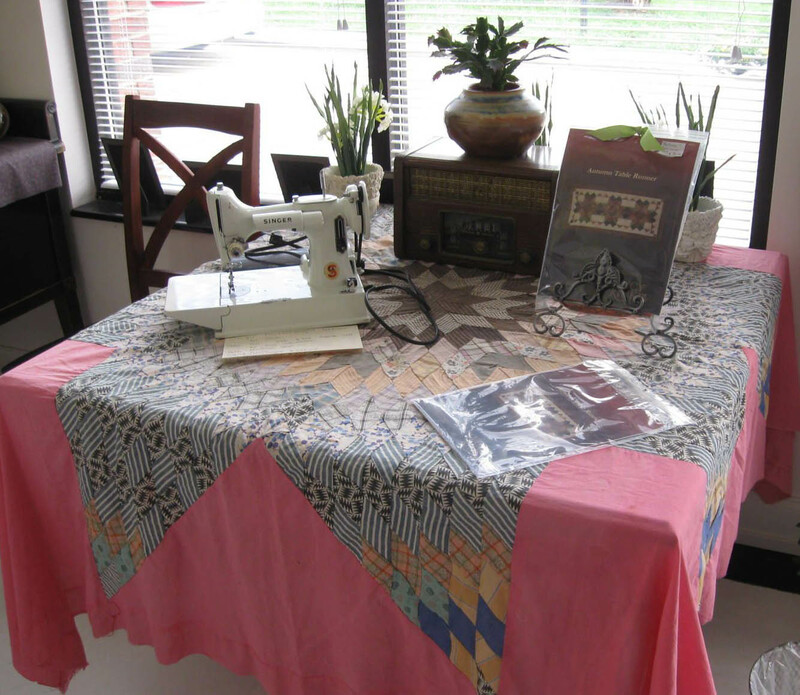 An antique seing machine sits on an antique quilt top. The Quilters Path successfully blends traditional and contemporary elegance. The shop offers a warm inviting atmosphere where you can go and lose yourself in a world of simple stitching pleasures.